1. The comet was right between the legs of Virgo at the moment Jupiter (the male child) entered the womb. 2. The comet came from the loins of Leo the Lion and made a straight shot to Virgo's womb. This is the only time this will ever happen as the video clearly shows. It's path from Leo to Virgo in 2016 is directly parallel to Jupiter. In other words, it traveled with Jupiter from Leo to Virgo. 3. The comet enters Virgo first. 4. The comet has an extremely eccentric orbit and for that reason it basically appears, moves into Leo, shoots straight across into Virgo, leaves and then disappears. 2017 also happens to be the comet's closest approach to earth and we will never see this comet again. 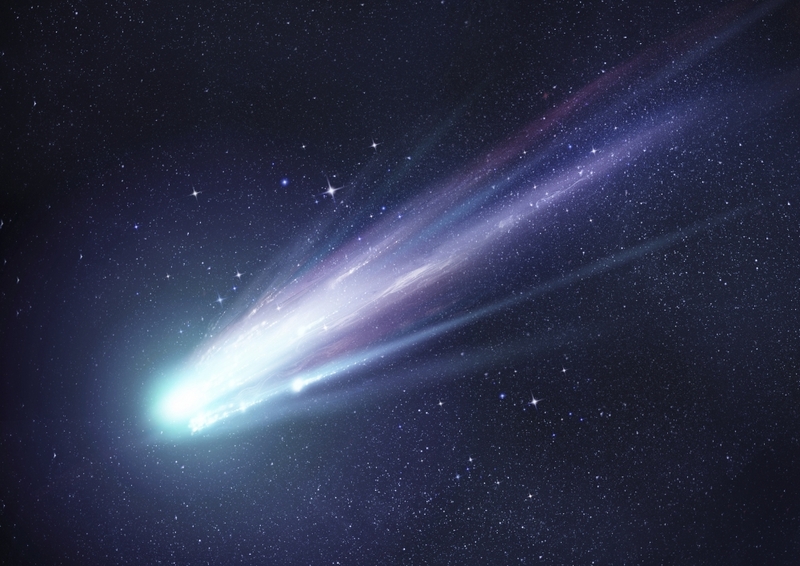 Is the comet symbolic of the divine seed? Further confirmation that the Revelation 12 Sign is the real deal and Jupiter represents the male child of Revelation 12:5? Luis Vega has an excellent analysis of this comet and its connection to the Revelation 12 Sign. You can read more about it here. Small correction, it is actually C/2017 "Borisov". "LoveJoy" is a different comet that doesn't appear to enter Leo or Virgo. Exact designation is C/2017 E1 Borisov. I verified using Stellarium that this comet does the things the YouTuber mentioned. It's pretty amazing! November is Athyr (Hathor); 17 Athyr began the celebration called "Passion of Osiris"; seeds were planted at Abydos, symbolizing the germinating seed (Comet C/2017EI) of Osiris rising from the dead. Osiris is On seen in Bab=Gate of On "Babylon"
Agree the video is amazing. However from Nov 17 to Sept 23 is 10 months & 6 days, not 9 months. I'm still not sure of the day when Jupiter is first in the womb but this seems a little early? amazing....but yea Jupiter wasn't quite in the womb. not to be picky, it probably doesn't matter anyway. they were both (Jupiter and the comet) close enough, non existing occurrence up until THAT time. WOW...just so amazing. GOD TRULY IS AMAZING ! What a time to be alive ! What we are witnessing is just too much for the mind, thank God HE is in control ! We are little sheep so in need. There are a lot of comments in this thread questioning the 'gestation' period from insemination to birth so I thought I'd attempt to add some clarity to the subject. 1. Human conception happens 45 minutes to 7 days after the 'seed' is planted. 4. Interesting to note that the number '923' occurs for the Rev. 12 Sign on 9/23 as well as the gestation period for Jupiter/Tzediq, to the very day. Not sure what that could mean. So, the 'Conception Comet' is right on the mark for correlating to an actual human baby's time in the womb from insemination to birth, which is rather amazing. Maybe this is what "knowledge shall increase" really meant! As "The Body of Christ" we are to always confirm EVERYTHING of this nature. Satan is still the "god" of this world until Jesus comes back to claim His Kingdom so the "bad guy" can manufacture just as many "miracles"...in the hope that he might cause just one brother or sister in the Lord to turn away from our God! We as the Bride of Christ should always be skeptical...UNTIL there is multiple confirmation of these kind of "SIGNS" to make sure they are of our "GOD" not their "god"! I tried it, it Works!! type in September 21 2017. Some very interesting things come up. Billy goat, eleveation, the secret, the giants, treachery, invasion, millions, vampires, human body, The Serpent- these are all intermixed with other words. very interesting though. Shabbat Shuvah ("Sabbath [of] Return" שבת שובה) refers to the Shabbat that occurs during the Ten Days of Repentance between Rosh Hashanah and Yom Kippur. Only one Shabbat can occur between these dates. This Shabbat is named after the first word of the Haftarah (Hosea 14:2-10) and literally means "Return!" It is perhaps a play on, but not to be confused with, the word Teshuvah (the word for repentance). Shabbat Shuva begins at sundown on Fri, 22 September 2017. The Torah reading for this Shabbat, September 23, 2017, is only one chapter, but what a chapter it is! It is Deuteronomy chapter 32:1-52. And the first scripture in Revelation 12 begins with these words, " And a great sign appeared in heaven"...the Greek word for "great" is "mega" which is translated as "loud" throughout the NT. So, the Lord is telling us from the very beginning of these two chapters that He is speaking loudly (mega) from the heavens and the earth needs to listen! We learn from Revelation 12 that the dragon/devil/Satan is going to be "thrown down to the earth and his angels (are) thrown down with him." (Rev.12:9) The dragon has arrived! This is the Jubilee Year for Jerusalem (1967/2017)...and many believe this is a Jubilee Year on God's calendar as well (Abib 1, 2017) to (Adar 29, 2018). And this is not all....there is much more! Give ear O' earth and hear the Words of His mouth! Now THAT is really cool! Thank you for sharing Redroksaz. Please note that the last verse I listed should read Leviticus 25:24 and not 25:23. I apologize for the error. I am soaking this up. Thank you so much. Thank you for sharing this amazing connection! Shalom in YESHUA'S PRECIOUS and HOLY NAME! Thank you for taking the time to write these encouraging words!...much appreciated! Don't know who was the first to discover. Thanks for spotting that article. That's a great analysis, so I've included it in the article above. It looks like Luis uses the YT video from World Breaker as one of his main sources. This is confirmed by the burning on the November 22nd 2016! This event on the ground takes place at the same time as the comet! Thus the Burning Sensation... not sure if I will go into it more than that, IF YOU KNOW WHAT I MEAN! Wow! Just went I thought this couldn't get any more awesome.. Bam! More awesomeness!!! "Here is a link to TheSkyLive website showing the Comet in question... click the small clock on the left to adjust the date and explore the movement." I'm glad you found this. I thought u might enjoy it when I posted it in the sign article part II. Perhaps u were already composing the article at the time. What other confirmations? Would love to see. Don't know who you are, nor where to find them. Are you Luis Vega? Aw man don't get me started. I can't type them all out because it takes a long time... I typed a few in another article... Other points of interest on this involve October 13th, which is the 100 year anniversary of the 'Miracle of the Sun' in Fatima. I'm not too great with the program 'Stellarium' since I just downloaded it and fiddled around after I noticed your question. I was more into fiddling with 'Google Sky Map' on my phone which has a 'time travel' feature. Another example is that after Jupiter leaves Virgo it spends another perfect pregnancy period in Libra (arguably the 'scales of judgement/justice' constellation)... at some significant times other planets enter Libra and it appears as if they are being 'weighed' against each other or together. Also regarding Mercury, nearly every English word beginning with 'Merc' refers to money/commerce/economy such as 'Merchant' or 'Mercenary' (just examples)... So maybe when Mercury does something significant, the so-called 'ruling elite' will stage their economic collapse scenario. I hope you see where I'm going with these. The possibilities are limitless. I'm not Luis Vega... I'm just another fallible man trying to figure out the signs given to us so please bear with me through any errors/mistakes. All I can do is use my God-given discernment through Jesus Christ to try and recognize these signs in the heavens, put into existence and motion a long, long time ago. These comments I make are not unique as I have tried so spread this info elsewhere on the internet as well. For this I am heavily censored by YT/G+ and my comments can almost always ONLY BE SEEN BY ME, unless the video-/content-creator explicitly allows my comments to bypass the censorship filter. I got zero notifications of this action. I only noted that when I was not signed in as myself, my comments were 100% invisible. Someone decided I was sharing too much stuff? So... where is Nibiru/ Planet X on Sept 24th? Considering that Planet X is a Red Dwarf Star, red because of the Iron Oxide Dust surrounding and will be passing by the Sun and Earth bringing it's 7 moons and a tail that will clip the bottom or HEAL of Jupitar.... He will bruise your heal and they your head.... Hmmm the meteorites to follow will be like 1/3 of the stars from the sky, the Gravitational pull will change the earths Poles by up to 22deg causing Tribulation type Volcanic, Title Waves, Earthquakes etc.... Arent you glad you are a Watcher and will be "prayed up" and repented (Oil in the lamp and wicks trimmed)!! The Bible describes how "if the days were not shortened nobody would survive." So when the Poles shift the day will go from 24hrs to 16hours...I grew up thinking that he made 7 yrs instead of 10 but I was wrong. Forget the post below from Anonymous. For Nemesis and Nibiru (or the twin star) begin with Carlos Munoz Ferrada and the now deceased Dr. Robert Harrington. For the two best YT channels I can suggest, see Soul Evolution and then Expitaly. Neither are Christian, but they convinced me! One has a link to a videocam sunrise from a beach in Brazil, and the damned second sun is there, rising. You see its reflection on the bay. There's something to it. The ancients weren't dummies. And I foresee God using it to turn this place upside down. What else would move mountains upside down and rip islands apart? Gravity has not been proven; CERN is trying. Gravity necessitates a moving Earth; God says Earth is fixed on a foundation that shall not more (Job 26:7). The Poles shifting 22 degrees (Its actually 23.2 degrees) resulted at the Flood when mountains were produced. There is no Planet X "Planet of the Crossing"
IGNORANCE! Please, stop with this trend of Flat Earth. If you can take a helicopter and hover for a few hours some feet above the ground, can you prove to us that earth below was stationary? Let's mark an X on the ground. If it moves while we are up there, then your theory is wrong. Besides, the three hour eclipse (and the ensuing earthquake) at the Crucifixion how do you explain when the moon was no the culprit? No Flat Earth needed to understand Scripture. A helicopter lifts off at whatever rotational velocity the Earth's surface has. "Now from the sixth hour there was darkness over all the land unto the ninth hour" Mat 27:45 This was no ordinary Solar Eclipse that brought darkness over the entire Earth. No need to spout IGNORANCE! It's bad form. I updated wikipedia with this latest discovery. Wow, thank you brother! It is nice to have a wikipedian to put rev 12 sign up, are you the original poster on Wikipedia? Checking out the events in Isreal.the pope wants the 1993 peace deal put in place now and with all that is going on with the Temple mount.AND HE SHALL CONFIRM THE CONVENT WITH MANY. You are making a large leap accusing the Pope of being the Antichrist Unknown. He is not. Jesus gave the warning in Rev 2:18-29 Thyatira. Continual Sacrifice means Mass in latin. Whilie it's still up in the air for me, no leap whatsoever is required to accuse the pope of being the AC. Both the pope and vatican are evil incarnate. If the pope is not the AC then he will be the FP or assist in some way. Just a fun thought. If the "conception" date is November 17, 2016 then the due date is 40 weeks later which is August 11,2017. Jesus said no one knows the day or hour but He didn't say "the week ". I looked up on the Jewish Calendar the week of August 6th (which includes the due date of August 11th). To my surprise at sundown on Sunday, August 6 is a minor Jewish holiday called "Tu B AV. It is a celebrated as a holiday similar to Valentines Day and "it has been said to be a great day for weddings." We in Christ are His bride ...so who knows right? Got truth? Pre-Trib is a lie. You know those emails you get which are kind of threatening regarding something you haven't paid, which are just phishing scams hoping you will click the link? That's like Alan Kurschner's message. Understand, I'm sure he believes his "bad news". The problem is the evil organization behind it, namely the dragon's kingdom. I do expect to see Alan in heaven...just a little after us. Read Revelation 7 to find out how he arrives. There's "the few" on the "narrow way", but have you ever considered the Revelation 7 PROFOUND meaning of "the many"...too many to count...in HEAVEN, early in the Tribulation, praising God? Understand, I do NOT mean Alan is an evil man! I mean he's likely a devout Christian responding in like fashion as Peter when Jesus said "Get thee behind me Satan", revealing the source of Peter's comment...AND right after Jesus had told Peter "flesh and blood has not revealed this to you, but My Father..."! But who do think wants to entice or scare or bring unbelief or distract from watching, or any other means to get people off the narrow road to the Rapture, even if they soon end up in heaven through beheading or any other means of destruction of their body such that it can no longer support life on the earth? Matthew 10:8 Heal the sick, raise the dead, cleanse the lepers, cast out demons: freely ye received, freely give. Perhaps I missed it, but I didn't see anyone comment that the comet leaving Leo, i.e. the Lion of Judah, and the antecedent of Jesus Christ through David, lends ever greater credibility to God's demonstrable plan as outlined through the stars and constellations. From Leviathan's Ruse (Alexander Lawrence), Jesus stated in Revelations 22:13 that "I am the Alpha and Omega", meaning that the Zodiac must begin and end with Leo. 2000 years ago we had the beginning, and I wonder if this sign coupled with the celestial events scheduled for 23rd September, don't signify that we come now to closure. Sola fide! Wow this is an incredible find, I'm glad I happened upon this article. Now I will share an incredible find of my own that may connect to this. I've been viewing the course of comets using stellarium and I was amazed to see the route comet 81P/Wild has taken in the past. Around very late July 2016 comet 81P went between the legs of Leo much the same as 67P did in late 2016. Now as Venus (The morning star) moved into the womb of Virgo on September 12th 2016, comet 81P moved into the womb just ahead of Venus and the two end up side by side. What made this even more interesting is the fact that comet 67P was literally entering Virgo just before 81p. Comet 67P entered the womb of Virgo on September 5th 2016 and comet 81p on September 8th 2016. Perhaps a (double insemination.) Now Venus moved through Virgo in just 6 days time. If you go back to early May 2016 you will see comet 81P moving through Pollux the (twins) constellation before moving through Cancer then Leo and finally Virgo. Comet 67P also moved through Pollux but in June 2009. This also seems to somehow tie into the alignment the great pyramid has on September 20th 2017. If you are not aware of this alignment then allow me to try and explain.. The (two) passages, the ascending passage and descending passage of the great pyramid called the Christ angle, align with Jupiter and Venus, Leo and Virgo on September 20th 2017. These alignments with the signs of Venus and Jupiter being birthed from the womb of Virgo after being inseminated by Leo via the comets 67P and 81P are really something to be exited about and warrant further study. I find it interesting that Comet 81P exits the womb of Virgo right between the 22nd and 23rd of September 2016. My guess is these signs that occurred in 2016 are very connected to the signs of 2017 and foreshadow what is to come. My apologies if what I wrote is difficult to understand for I am no expert on these matters, though I am always keeping watch, searching, seeking out the signs for the return of Christ. I hope this information can help someone else to gain better understanding of these incredible signs the Lord has given us. Though I believe the time is very short so be ready, repent and look up. Greetings, dear brethren . . . I am slow in digesting all this information. Just today i was able to finally understand the 120 degree movement of the dragon's tail and i now understand the timing. Just wanted to share something re: the red dragon. In 2016 researchers found a red dragon at the bottom of the ocean near Australia. That may not be pertinent, but it was curious that this red dragon has lost its appendages, and scientists speculate that the dragon lost its appendages "through evolution." Hmmm. Also interesting that in March of this year a massive alligator about 13 feet long was seen on a SC golf course. SC being on the path of totality and people just playing golf as a monster dragon walks by. The news reported that he was not killed because he has never caused any trouble in the past. I appreciate this site so much - it is helping me to be aware as we watch and wait for our Wonderful Savior, to walk in pureness of heart and make sure i have forgiven fully those who have injured me during this sojourn on earth. I want to be fully prepared for Him with no regrets and to walk in love. Won't it be fantastic to see Him ruling as King! As someone else noted, if the conception comet entered Virgo in late Nov 2016, the birth would be in August 2017, right? As in August 21st?? What do you all think? Use this link to calculate dates. I've just published a book called, "The Great and Wondrous Sign", about the fulfillment of Revelation chapter 12, September 22-23. God led me to discover this event independently and I have been researching it ever since. DISCOVERY: I have discovered proof of the true identity of the Great Red Dragon. Is it Niburu or something hiding in plain sight?